HomeSpreading holiday spirit and wishing a very merry SaxMas to all! Spreading holiday spirit and wishing a very merry SaxMas to all! Music is in the air this holiday season. While San Jose’s 24th Annual Saxophone Christmas is over, on 16 December 2017, 217 saxophonists playing everything from sopranino to bass saxes spread the joy of holiday music through the air at both Christmas in the Park and Vallco. To get a sense of what this event was like and raise your holiday spirits, please enjoy the following sampling of several selections from previous San Jose SaxMases. With new commemorative shirts each year, saxophone players from near and far gather together for a two-hour rehearsal in the morning. They then play two one-hour concerts, the first outside at Christmas in the Park in San Jose, and the second at an indoor venue. 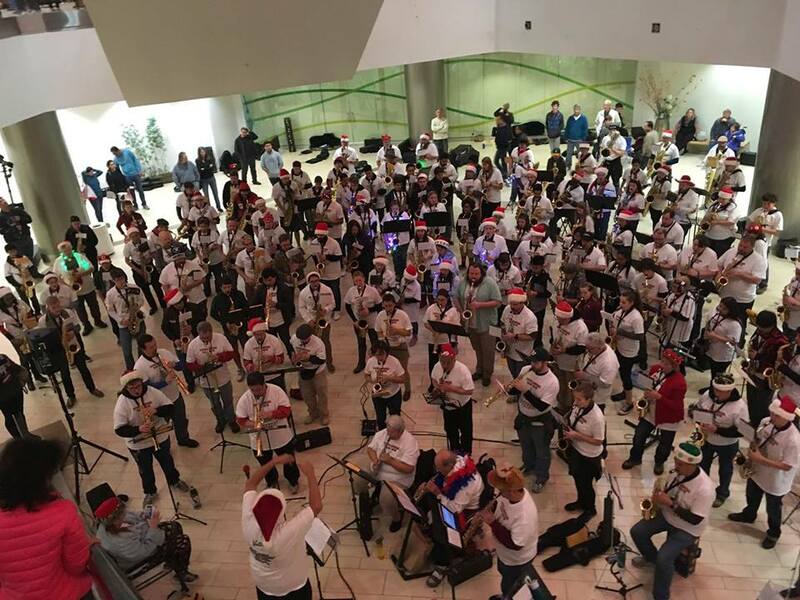 While the group used to play at Eastridge Mall in San Jose for their indoor concert in the early years of SaxMas, for the last several years, the indoor concert has moved to Vallco in Cupertino. Even though the mall is mostly shutdown, the movie theaters are still there, and so far, the large entrance area directly under the theaters has provided a nice performance space. Audience members can either gather near the players on the bottom level, or they can gaze down from the two levels above and enjoy how the music fills the tower. It is very difficult not to have a smile on your face as you enjoy this event. The atmosphere is festive, and the energy from the 200+ members of this rather unique “saxophone orchestra” is contagious. Stay up to date and prepare to join in either as a player or an audience member for the 25th Annual San Jose Saxophone Christmas on 15 December 2018. Check the SJ SaxMas site throughout the year as Saxophone Christmas founder, Ray Bernd, is hoping to add a few more surprises to celebrate a quarter century of wishing everyone a very merry SaxMas!